I tend to pick up bargains as I see them. But not just willy nilly. I used to do that and I would end up with a pile of stuff unsuitable for any of my family and friends and then I would just end up giving it back to the charity shop. Most of my friends would be uncomfortable with second hand items unless they were books or antiques. So does this mean I never buy charity shop goods for my pressie drawer? Absolutely not, it does mean however that anything I do buy is either pristine or brand new. Look at this brain game set for example . Absolutely perfect for any number f friends /family members who like mental challenges. It is brand spanking new and set me back all of £1.50. In a regular shop this would probably have cost me £10. It’s new and sealed and so there is no difference whatsoever in this and one bought in the original shop. A birthday gift for £1.50 makes my thrifty heart smile. I have lots of things in my present drawer waiting for the day. A few of these are gifts that were duplicates of things we already have. 1 or 2 are unwanted gifts that were just not right for us. Some were bought in the sales and were unbelievably good value. (Check out my post on out of season sales shopping) Most are from charity shops brand new and just waiting for a new home. I very rarely get caught out at birthday these days. To make double sure I have just purchase a mini glue gun lots of hair slides and flower beads. I have made up a big batch of hair slides for next to nothing (these are so dear in the shops) We have a lot of little girls parties coming up this year so these will sit on cards in the gift drawer ready to go. I also keep pre-made, homemade labels and recycled gift wrap and bags (from presents we have had) in there too. Do you have a gift drawer? Next Post I did my Sports Relief 10k in my bedroom! I think when you have children (and live in a semi rural area like me, where shops are not on my doorstep), that having a present drawer is essential. It lets you buy things at great quality, at amazing value. What is not to love about that?? Donna @ Little Lilypad Co recently posted..Top 10 TV Mums that I want to play me in the movie of my life. Oh yes, I have a gift cupboard too that I keep stocked up with ‘new’ second-hand items, unwanted prizes and things I’ve picked up in the sales. It means I always have an emergency present! Those hairslides are SO pretty! I do have a present drawer, yes, it saves so much money and that agony when you realise you haven’t got a gift as they head out of the door to a party! Chris at Thinly Spread recently posted..Energy Saving Tips for Mother’s Day! Scoperks recently posted..A chance to WIN your very own Google Chromecast! Really I have never thought to look and we have lots of shops locally – thank you for the heads up. What a great idea with those slides! I was thinking the other day that I should start something like this now the mini one is about to turn one and the parties begin! I have a gift cupboard, it is always empty by Christmas and gets filled up in the boots sale although I also add to it throughout the year. I use it for birthdays/Christmas but also for raffles/charity events throughout the year. I love the hair grips though, it costs us a fortune in hair accessories every year so I might have to look into this! Hi Becky ! 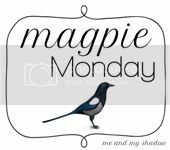 Back to magpie Monday now I have more time ! Love the idea of a present drawer. I have never been organised enough for one of those. Maybe now I will be. Amazing what new items you can find. Absolutely. At Christmas I had to buy nothing as I’d done so well at the boot fairs all year. Cath Kidston with the labels still on, brand new expensive gifts for peanuts. My recipients did much better out of it than if I’d had to go to regular shops! This is a fab idea – and a good reason for me to clear out one of many “messy drawers” in our house and make it a gift drawer. I do have a gift drawer, along with recycled gift wrap, a card stockpile and ribbons! Love your bargains… thanks for sharing. I’m also following you on bloglovin’ now. Those hairslides are just fabulous, what a great idea. I used to have a gift bag, but I’ve let it dwindle, this has inspired me to get it going again! Love those hairslides – I’m definitely going to give that a go!